Upset and frustrated, a group of friends and relatives sat in a small London café discussing the attack on Gaza strip in 2008 and the state of the people there. They thought they needed to something, but what could it be? One of the group members suggested bicycling to draw the attention of the world to the issue, and thus Cycling4Gaza was born. In an exclusive interview with Weekend Review, Tamara Ben-Halim, one of Cycling4Gaza’s founders, explains how Cycling4Gaza started, its aim, achievement and future plans. “What began as a casual conversation concerning the abrupt shift of media attention away from Palestinians in Gaza as soon as the last bombs were dropped,” says Ben-Halim, soon turned into an idea that would bring the focus back on the “disastrous conditions that people in Gaza had been left in, as well as thinking of innovative ways to garner support for people there that didn’t involve simply writing a cheque”. A cousin of Ben-Halim had seen something online about a London to Paris charity bike ride and suggested to the rest of the group that they take part in support of the UK charity, Medical Aid for Palestinians (MAP UK). Initially, the idea was for a small group of friends to join an existing organised charity bike ride. “When we spoke to MAP UK, they encouraged us to think bigger. They told us that if we could recruit 20 cyclists then we could have our own bike ride dedicated to MAP and supporting their emergency healthcare projects in Gaza,” Ben-Halim says. Instantly Ben-Halim and her friends began to build their own project, create a website, marketing material, a logo, and started spreading the word and recruiting people to take part in the cycling challenge. This was in March 2009. “We had less than four months to pull off everything. By April, we began recruiting in earnest, through word of mouth and distributing flyers around London, as well as through MAP’s network. Somehow, by mid-June and just two weeks before the ride, 27 people had signed up,” she says. The challenge was a success, raising more than £90,000 (Dh482,537) for MAP’s emergency maternal and neonatal healthcare projects, and received widespread media coverage. It became evident by the end of the ride that this couldn’t be a one-off effort. Over the years, Cycling4Gaza went from an ad hoc initiative to an international organised grassroots effort. Cycling4Gaza has grown significantly since its inception, particularly after the first three years. “Something happened after that. The word-of-mouth was so effective that many people I spoke to told me they’d heard of the initiative or had a friend who had taken part,” Ben-Halim says. Also it is the conviction that as a group “dedicated to a particular cause, when united in our efforts, we can actually make a difference, no matter how small the impact”. Describing him as one of the funniest and most charming teenagers she has met, Ben-Halim recalls how he was constantly surrounded by people who wanted to be in his company. “Perhaps, without realising it, he made us think a lot about our own privilege,” she adds. But on the contrary, “we found nothing but genuine support on the road. I’ve thought about this a lot, and I think that we, people in general, make great mistakes in conflating people with the government,” says Ben-Halim. Ben-Halim vividly remembers “one of the nicest things I’ve heard”. 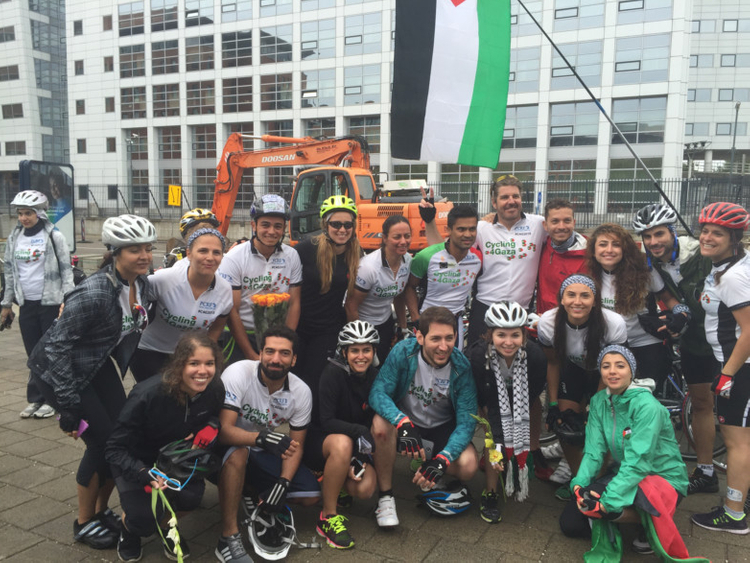 One cyclist admitted to the team that taking part in the ride brought him closer to Palestine. He is, like many Palestinians, a member of the diaspora who has never been able to go back and feels far removed from his homeland. “To hear that his experience with C4G brought him closer to his home was powerful,” says Ben-Halim. The nearly £1 million that Cycling4Gaza has raised to date has allowed its charity partners in Gaza to help more than 14,000 Palestinians in terms of mental health, medical, educational, psychosocial and physical support as well as in rehabilitation efforts. This year Cycling4Gaza’s eighth cycle will be held in Norway in the first week of August. The team has partnered PACES, an organisation that also uses sports as a means to make a difference. PACES was founded in 2006 with the aim of providing healthy, structured after-school sports programmes for Palestinian children — for girls as a means of getting out of their homes and into programmes that empower them within their communities, and for boys who would otherwise be on the streets and exposed to violence and negative or destructive influences. Ben-Halim says there is an ongoing internal conversation about whether Cycling4Gaza should become an official “institution” as opposed to a small grassroots effort. “On the one hand, expanding means reaching out to more people and potentially making more difference. On the other hand, staying small and agile means we maintain our flexibility and independence, all the while ensuring that we work to the highest standard and keep the quality of our efforts strong.” Only time will tell what direction Cycling4Gaza will take. But for Ben-Halim, every year that she takes part in the cycling challenges, she is inspired, energised and “my faith in the power of people to do good is reinforced”. Cycling4Gaza provides hope for Ben-Halim just as it gives hope to many benefitting from its efforts. For more information, visit facebook.com/cycling4gaza or twitter.com/cycling4gaza.